Timber Wolf Full Tang Atomic Steel Hawk Bill with Sheath | BUDK.com - Knives & Swords At The Lowest Prices! 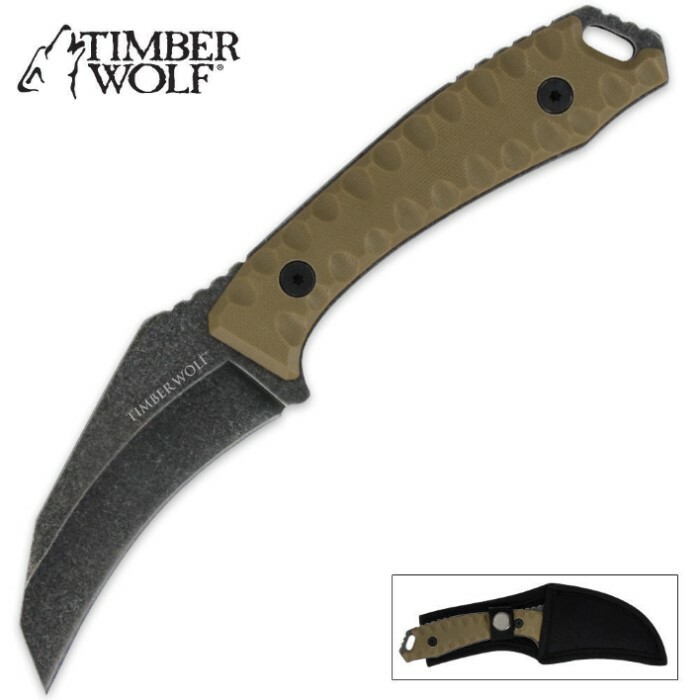 This Timber Wolf Atomic Steel Hawk Bill knife is rugged and extremely durable. The 3.5mm thick stainless steel blade with a stone wash finish features a full-tang construction that won't let you down. I am ordering another after I write this review! It is an all-round utility knife, that turns into protection with attitude! I just aquired the Timber Wolf hawk and I am very pleased.It is not to big and not too small.Feels really good in the hand with all type grips.I tried it out on some heavy cardboard with some different slashing moves and was surprised with its cutting power.Also its small enough to carry as a back-up protection piece where leagle.I recommened all Timber Wolf knives in this class.Good products from Timber Wolf.